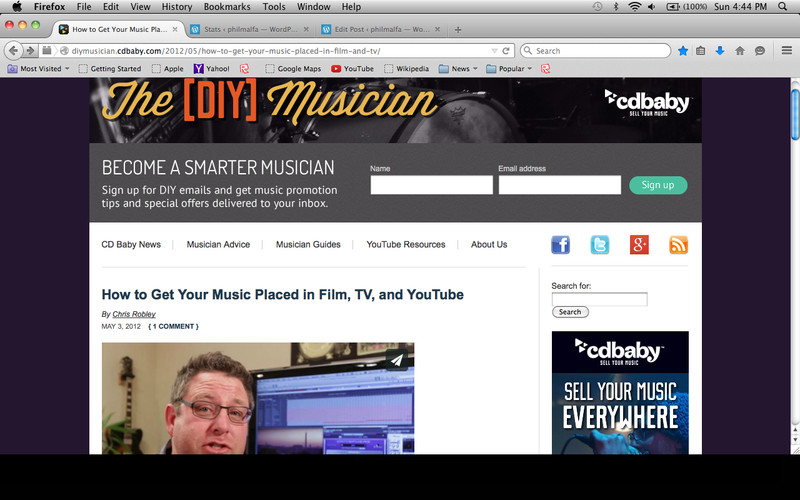 Basically, the site is a do-it-yourself guide on how to submit your music so it can get placed into film, tv, or video. The layout is nicely designed and the site is easy to navigate. There are tabs for musician blogs, podcasts, and music discovery podcasts; you can also sign up with CD Baby to help get your music exposed on a global level. I think the site is produced well. It has resources on how to contact music supervisors, find out what projects are in production, and musician advice, among an abundance of other information. The video on the the homepage with Joe Solo is a little cheesy but it has some valuable information. For example, Joe S gives tips on the importance of targeting projects that need the music you create by doing research and pitching only material that is suited to the story or genre of the film. Also, he talks about the importance of finding out who the music supervisor for a film is and tells you how to do it. Another tip I found to be valuable in the video is to always make sure you send in a quality master of your music, never a demo. The great thing about doing this project was finding a site that I didn’t know existed. I know I’m only scratching the surface of the site but I will be doing more digging and hopefully submit some music too. This entry was posted in Sp15-P3 Blog Search on April 20, 2015 by Philip Malfa.